Jeff "Tain" Watts, the most vivacious drummer to emerge from the much ballyhooed "young lions phenomenon of the early 1980s, has reached beyond traditional hard-bop to embrace the diverse stylistic influences that inspire him. His straight-ahead credentials are well-documented on seminal records from Wynton and Branford Marsalis. The ensuing years have found him exploring more adventurous territory, supporting Geri Allen, Steve Coleman, Alice Coltrane and Greg Osby. 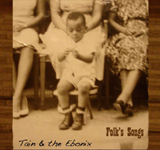 Watt's current quartet, the awkwardly named Tain & the Ebonix, present a varied but not overly eclectic program of solid mainstream jazz spiced with an edgy bite. Up-and-coming saxophonist Marcus Strickland (Roy Haynes, Dave Douglas) plays with soulful gusto and chromatic intensity. His fractured delivery on Jarrett's "Rotation" (dedicated to Dewey Redman) invokes the great tenor in spirit without aping his distinctive delivery. Stalwart bassist Christian McBride offers more than virtuosic support; whether unfurling electric rivulets or bowing resonant arco lines on his trusty upright, his accompaniment is tasteful and unobtrusive. Pianist David Kikoski offers advanced harmonic accompaniment, filling the void left by Watts' close associate, the late Kenny Kirkland. Burning post-bop is still Watts' forte; "Samo" opens the album with empathetic group interplay and dynamic interaction. "Ling's Lope" (dedicated to Branford Marsalis) combines Monkish quirkiness with a slinky groove, while the riotous "Seed of Blackzilla" stuns with its elastic, polyrhythmic drive, fiery solos and undulating collective energy. Invoking Keith Jarrett's renowned 1970s American Quartet, two freewheeling versions of "Rotation" push the boundaries of tradition to the breaking point, both featuring compelling solos from the leader. Journeying into exotic territory, Kirkland's "Blasphemy" borrows Afro-Cuban sensibilities with plucky percussive accompaniment and a loping, bittersweet melody. Not everything is roiling modernism and pulverizing swing; "Laura Elizabeth" and "Galilee" are tender ballads, providing sonic respite. "Blues 4 Curtis" (dedicated to Curtis Mayfield) adds Henry Hey's simmering Rhodes and David Gilmore's surly electric guitar for a joyous, amplified rave-up. Modulating between a grinding funk vamp and pumping roadhouse blues, it reveals the true kinetic potential of the former Tonight Show drummer. Eclectic collections are rarely without missteps however. The pedestrian funk of "Same Page..." (featuring Watts' vocal cameo as Juan Tainish) is an incongruous but thankfully brief break in the album's otherwise compelling pacing. Overall, Folks' Music is a splendid example of mainstream jazz that subtly stretches beyond conservative notions of the tradition. Personnel: Jeff "Tain" Watts: drums, percussion; Marcus Strickland: tenor and soprano saxophone; Christian McBride: acoustic and electric bass; David Kikoski: piano; Henry Key: keyboards (6, 7, 10); David Gilmore: guitar (7, 9); Samuel Torres: percussion (10); Juan Tainish: vocals (9).